(a) Remove the 2 engine wire harness clamps. (b) Remove the 3 nuts and disconnect the engine wire harness. (c) Remove the 9 bolts and cylinder head cover. (a) Using an E6 torx) socket wrench, remove the 2 bolts and disconnect the engine wire harness protector. (b) Remove the 9 bolts and cylinder head cover. (b) Remove the O-ring from the sensor. NOTICE: Before using SST, apply lubricating oil to the threads and tip of the center bolt 150. Temporarily install the crankshaft pulley bolt and washer to the crankshaft. Turn the crankshaft clockwise, and align the timing mark of the crankshaft timing pulley with the oil pump body. Check that timing marks of the camshaft timing pulleys and No. 3 timing belt cover are aligned. If not, turn the crankshaft 1 revolution (360 ). (c) Set the No. 1 cylinder to approximately 60 BTDC/ compression. NOTICE: With the timing belt removed: The crankshaft pulley must be at the correct angle to avoid damage in later steps. If the crankshaft pulley is at the wrong angle and the camshaft timing pulley and the camshaft are removed, the piston head and valve head may come in contact and damaged. HINT: Arrange the camshaft timing pulleys (RH and LH sides) so that they can be returned to the original locations when reassembling. (a) Remove the bolt and the timing belt plate. (b) Install the pulley bolt to the crankshaft. (c) Using SST, remove the crankshaft timing pulley. Before using SST, apply lubricating oil to the threads and tip of the center bolt 150. (a) Remove the 3 bolts and 3 nuts, then remove the water pump and the gasket. NOTICE: Since the thrust clearance of the camshaft is small, the camshaft must be kept level while it is being removed. If the camshaft is not kept level, damage to the cylinder head or to the camshaft may result. To avoid this, the following steps should be carried out. (a) Align the camshaft drive and driven gear's timing marks (1 dot mark each) by turning the camshaft with a wrench. (c) Uniformly loosen and remove the 10 bearing cap bolts in the sequence shown in the illustration. Remove the 5 bearing caps and the No. 3 camshaft. (a) Uniformly loosen and remove the 10 bearing cap bolts in the sequence shown in the illustration. Remove the 5 bearing caps and the No. 4 camshaft. (b) Remove the oil seal from the No. 4 camshaft. (b) Check that the VVT-i does not turn. (c) Cover all the oil ports with vinyl tape except the port on the advanced angle side (nearest to the convex portion) shown in the illustration. (d) Using an air gun, apply about 100 kPa (1 kgf/cm2, 14 psi) of air pressure to the port on the advanced angle side. NOTICE: Some oil will spill out. Contain the oil with a shop rag. HINT: This operation releases the lock pin for the extreme retarded angle lock. (e) Under the condition above, check that the VVT-i can be turned by hand to the advanced angle side, the direction of the white arrow in the illustration. HINT: The VVT-i will turn to the advanced angle side without applying force by hand depending on the force of the air pressure applied. Also, if applying pressure to the oil path is difficult as a result of air leakage from the port, the lock-pin may be difficult to release. (f) Check that the VVT-i moves freely within a 30 range. Avoid moving the VVT-i unit to the extreme retarded angle position as the lock-pin will re-engage. Standard: Smooth movable range is about 30 (g) Turn the VVT-i by hand and lock it at the extreme retarded angle position. NOTICE: Do not remove or install the timing gear (VVT-i) unless you are replacing the VVT-i or the camshaft. Remove it with the lock-pin engaged and locked at the extreme retarded angle position. Never remove the 3 bolts on the gear. NOTICE: Be careful not to damage the camshaft. (b) Using SST, turn the sub gear counterclockwise and remove the service bolt. (d) Remove the wave washer, camshaft sub gear and camshaft gear bolt washer. HINT: Arrange the camshaft sub gears and gear bolt washers (RH and LH sides) so that they can be returned to their original location when reassembled. (a) Remove the plug, gasket and valve filter. (a) Using a socket hexagon wrench 8, remove the hexagon bolt. (b) Uniformly loosen the 8 cylinder head bolts in the sequence shown in the illustration. Remove the 8 cylinder head bolts and plate washers. (a) Uniformly loosen and remove the 8 bolts and 2 nuts in the sequence shown in the illustration. Remove the water inlet housing. (b) Using a socket hexagon wrench 12, remove the oil filter union. (a) Remove the 10 bolts and 2 nuts. (b) Insert the blade of SST between the oil pan No. 1 and oil pan No. 2. Cut through the sealer and remove the oil pan No. 2. Do not damage the contact surface of oil pan No. 1 and oil pan No. 2. Do not damage the flange portion of the oil pan No. 2 during removal. (a) Remove the bolt and 2 nuts. Then remove the oil strainer and the gasket. (a) Uniformly loosen and remove the 6 bolts. 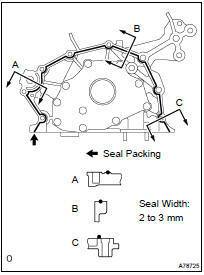 (b) Using a screwdriver, remove the oil seal retainer by prying between the oil seal retainer and the main bearing cap. (a) Using a screwdriver and a hammer, tap out the oil seal. (a) Bend up the tab on the ventilation baffle plate which prevents the gasket from slipping out. NOTICE: Be careful not to damage the baffle plate of the cylinder head cover. (b) Using a screwdriver and a hammer, tap out the gasket. (c) Using needle-nose pliers, pry out the gasket. NOTICE: Be careful not to damage the cylinder head cover. Do not utilize timing belt tension when installing or removing the mounting bolt of the camshaft timing pulley. Check the belt for any defects, as shown in the illustrations. (c) If there is noticeable wear or cracks on the belt, check to see if there are nicks on the side of the idler pulley lock and water pump. Check for foreign objects on the pulley teeth. (a) Inspect the camshaft for runout. Using a dial indicator, measure the runout at the center journal. If the runout is greater than the maximum, replace the camshaft. (b) Inspect the cam lobes. (c) Inspect the camshaft journals. (a) Using SST and a hammer, tap in a new gasket until its surface is flush with the upper edge of the cylinder head cover. (b) Return the ventilation plate tab to its original position. (c) Apply a light coat of MP grease to the gasket lip. (a) Using SST and a hammer, tap in a new oil seal until its surface is flush with the rear oil seal retainer edge. Keep the gap between the rear oil seal retainer edge and the oil seal free of foreign matter. (a) Remove any old packing material from the contact surface. (b) Apply a continuous bead of seal packing (seal width: 2 to 3 mm (0.08 to 0.12 in. )), as shown in the illustration. Install the oil seal retainer within 3 minutes after applying seal packing. (c) Install the oil seal retainer. Tighten the 6 bolts uniformly. (a) Using SST and a hammer, tap in a new oil seal until its surface is flush with the oil pump body edge. Keep the gap between the oil pump body edge and the oil seal free of foreign matter. (b) Apply a light coat of engine oil to a new O-ring and place it on the cylinder block. (c) Apply a continuous bead of seal packing (seal width: 2 to 3 mm (0.08 to 0.12 in. )), as shown in the illustration. (d) Align the key of the oil pump drive gear with the keyway located on the crankshaft, and slide the oil pump into place. (e) Install the oil pump with the 9 bolts. Tighten the bolts uniformly in several steps. (a) Remove any old seal packing from the contact surface. (b) Apply a continuous bead of seal packing (seal width: 3 to 4 mm (0.12 to 0.16 in. )), as shown in the illustration. Apply seal packing to the outer side of the bolt holes in region "X". Apply seal packing to the inner side of the bolt holes in region "Y". (c) Install the oil pan No. 1 with the 15 bolts and 2 nuts. Tighten the bolts uniformly in several steps. (b) Apply a continuous bead of seal packing (seal width: 4 to 5 mm (0.16 to 0.20 in. )), as shown in the illustration. (c) Install the oil pan No. 2 with the 10 bolts and 2 nuts. (a) Using a socket hexagon wrench 12, install the oil filter union. Torque: 30 NVm (306 kgfVcm, 22 ftVlbf) (b) Check and clean the oil filter installation surface. (c) Apply clean engine oil to the gasket of a new oil filter. (d) Lightly screw the oil filter into place, and tighten it until the gasket contacts the seat. (e) Using SST, tighten it an additional 3/4 turn. (b) Apply a continuous bead of seal packing (seal width: 3 to 5 mm (0.12 to 0.20 in.)) as shown in the illustration. Install the water inlet housing within 3 minutes after applying seal packing. Do not expose the seal to coolant for at least 2 hours after installing. (c) Install the water inlet housing with the 8 bolts and 2 nuts. Uniformly tighten the bolts and nuts in the sequence shown in the illustration. (a) Place a new cylinder head gasket on the cylinder block with the R mark upside down, as shown in the illustration. Make sure the cylinder head gasket is facing in the correct direction. Place the cylinder head on the gasket carefully in order not to damage the gasket at the bottom part of the head. NOTICE: The cylinder head bolts are tightened in 2 successive steps. (a) Apply a light coat of engine oil on the threads of the cylinder head bolts. (b) Install the plate washers to the cylinder head bolts. (c) Uniformly install and tighten the 8 cylinder head bolts in the sequence shown in the illustration. (d) Mark the front side of each cylinder head bolt head with paint, as shown in the illustration. (e) Retighten the cylinder head bolts by 90 in the same sequence as step (c). (f) Check that each painted mark is now at a 90 angle to the front. (g) Using a socket hexagon wrench 8, install the hexagon bolt. 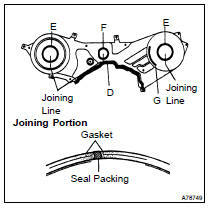 (a) Place a new cylinder head gasket on the cylinder block with the L mark, as shown in the illustration. (a) Apply a light coat of engine oil to the threads of the cylinder head bolts. (a) Check that no foreign matter is on the mesh part of the filter. (b) Assemble the valve filter and the plug. (c) Install a new gasket and the plug. (a) Install a new gasket and the rear cover with the 4 bolts. HINT: Attach the pins on the gears to the gear bolt washer ends. NOTICE: Be careful not to damage the camshaft journals. HINT: When installing the camshaft, make certain that the torsional spring force of the sub gear has been eliminated by installation of the service bolt. NOTICE: Install the VVT-i with the lock-pin engaged and locked at the extreme retarded angle position. New nuts must be used when replacing the VVT-i unit. (c) Using a 46 mm socket wrench, install and tighten a lock nut by turning it counterclockwise. Never use any tools other than the socket wrench. Other tools will deform the cam angle rotor. NOTICE: Since the thrust clearance of the camshaft is small, the camshaft must be kept level while it is being installed. If the camshaft is not kept level, damage to the cylinder head or to the camshaft may result. To avoid this, the following steps must be carried out. (c) Install the oil seal to the camshaft. (d) Apply MP grease to a new oil seal lip. (b) Align the camshaft drive and driven gear's timing marks (2 dot mark each). (e) Apply a light coat of engine oil on the threads of the bearing cap bolts. (b) Place the No. 4 camshaft at a 90 angle of the timing mark (1 dot mark) on the cylinder head. (b) Align the camshaft drive and driven gear's timing marks (1 dot mark each). (a) Install a new gasket and the water pump with the 3 bolts and 3 nuts. (a) Align the keyway of the timing pulley with the key located on the crankshaft and slide the timing pulley into place. NOTICE: Do not scratch the sensor area of the crankshaft timing pulley. (b) Install the timing belt plate with the bolt. 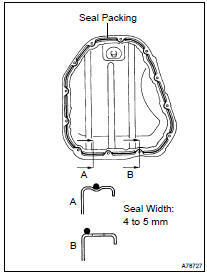 (b) If the timing belt cover gasket needs to be repaired, follow the procedure below. NOTICE: The torque specification above is the SST without extension tool specification. Use the special formula to calculate the SST with extension tool torque specification (see page 01-5 ). Check that the idler pulley turns smoothly. Visually check the sealed portion of the idler pulley for oil leakage. If there is any doubt about the idller pulleys condition, replace the idller pulleys. NOTICE: To prevent contacting the piston head and the valve head from colliding, set the crankshaft pulley at approximately 60 BTDC/compression position. (f) Using SST, turn the crankshaft pulley, and align the timing marks of the timing pulley with the No. 3 timing belt cover. (g) Turn the crankshaft 2 revolutions slowly, and align the timing mark of the crankshaft timing pulley with the oil pump body. (a) Align the keyway of the pulley with the key located on the crankshaft and slide the pulley into place. (a) Apply a light coat of engine oil to a new O-ring and install it to the level gage guide. (b) Install the level gage guide. (a) Install the gasket to the cylinder head cover. 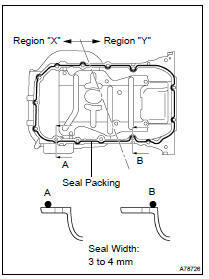 (b) Apply seal packing to the cylinder head, as shown in the illustration. Install the cylinder head cover within 3 minutes after applying seal packing. (c) Install the cylinder head cover with the 9 bolts. Tighten the bolts uniformly in several steps. (a) Apply adhesive to 2 or 3 threads. Adhesive: Part No. 08833-00070, THREE BOND 1324 or equivalent (b) Install the ventilation valve.